The Atlantic salmon covered in this recommendation are from two specific farms – Kvarøy and Selsøyvik in central Nordland of Northern Norway. About 60% of the production is exported to the US under the brand name of Blue Circle. Production in 2015 was 8,500 tonnes. Much data is available on the Kvarøy and Selsøyvik farms. In addition, much scientific literature is also publically available on the Norwegian salmon industry. The farms are audited by Whole Foods standards. The industry is well-managed. Source of stock is domesticated broodstock; therefore wild populations of Atlantic salmon are not depleted to source the aquaculture operations. The farmed Atlantic salmon consume 1lb of wild fish meal to produce 1lb of meat. This is an effective feed conversion ratio which limits fishing pressure applied on wild populations. Kvarøy and Selsøyvik reported no escaped salmon for over 10 years. The use of lumpsucker fish to control sea lice necessitates the use of small-mesh netting. This reduces the likelihood of escapes. Any escapes could potentially enter rivers and interact with wild populations. Although the genetic impacts on the wild salmon are low, is remains a risk. Kvarøy and Selsøyvik have not had any viral outbreaks in the past 10 years although sea lice continues to be controlled via lumpsucker fish. There are concerns that sea lice could affect that wild sea trout populations. Open net pens allow discharge to flow into the environment and have the potential to cause many negative habitat impacts. However, the Kvarøy and Selsøyvik farms are located in open coastal areas instead of fjords where there is less water circulation. Impacts of effluent have been shown to be low. Any benthic impacts have been shown to be reversible after fallowing. The farms are unlikely to cause cumulative impacts. The farms adhere to Whole Foods standards. This places many restrictions on chemical use. Instead of using pesticides, the farms use lumpsucker cleaner fish. Use of antibiotics and copper-based antifoulants are prohibited. Of some concern is the development of a resistance of hydrogen peroxide. Overall, the farms have a low chemical usage. Virtually all Atlantic salmon is now farmed rather than wild-caught. Recirculating aquaculture systems (RAS) are similar for various farmed species. This recommendation applies to all species grown in RAS except for those where a separate species-specific RAS recommendation is available. Closed containment has recently emerged in the farming industry as an alternative to net pens in order to reduce the environmental impacts of an aquaculture system that is open to the environment. British Columbia’s salmon farms produce approximately 76,00 mt of Atlantic salmon annually. Although this is small compared to Norway’s 1.3 million mt, BC is a major source of farmed salmon in North American seafood markets. The industry is concentrated in the area from northern Straight of Georgia through Queen Charlotte Sound, between Vancouver Island and the mainland, and on the west coast of Vancouver Island. About 60 farm sites are in operation at any given time. There is much debate surrounding the interaction between farmed and wild salmon in BC. have been classified by the World Health Organization as being highly important to human health. The feed conversion ratio has improved from 2:1lb (of wild fish to produce farmed fish) to its current 1.25: 1lb. Because there is a net edible protein loss of 12%, this criteria is of moderate concern. Construction of open net pens has improved over time, and the risk of escapes has decreased, but cannot be said to have been eliminated. No populations of Atlantic salmon have been observed to have become successfully established in BC, perhaps due to the fact that they are domesticated and outside their native range. Despite this observation, the potential negative impacts on the environment if a population did succeed in establishing, are highly significant. Disease and parasite outbreaks have declined on fish farms, although are still consistent events in wild fish. Sea lice at salmon farms are thought to have been managed to levels that were deemed to be too low to cause declines in wild salmon, however, higher lice levels due to warmer water temperatures highlight the industry’s vulnerability to environmental variability. However, much uncertainty still exists regarding transmission of diseases from farmed to wild salmon. Norway is the world’s largest producer of farmed salmon, with 1.3 million mt produced in 2015. There are about 1000 salmon farms which represent a substantial point source of nutrient pollution. Salmon farming in Norway releases 540,000 to 624,000 mt of organic matter a year from approximately 1.6 million mt of added feed. Studies in some of Norway’s densest farming regions indicate a substantial risk of eutrophication. Antibiotic use in Norway is relatively low, with 212 kg used in 2016. However, 30% of the total antibiotics used are listed as critically important for human medicine by the World Health Organization (WHO). Pesticide use has been increasing, and resistance in sea lice has been observed, suggesting overuse of pesticides. The cumulative impacts of antibiotic and pesticide use on numerous farms have not been studied. Management is relatively good in Norway with much data available from scientific assessments. Improvements could be made in certain areas. Farmed Atlantic salmon in Norway are sourced from domestic stock, thereby putting no pressure on wild Atlantic salmon stocks. About 1.3lbs of wild fish product are required to produce 1lb of farmed salmon which is a relatively low amount. This is partly due to the increased use of non-edible land-animal byproduct and plant products. Wild Atlantic salmon, sea trout, and char are the species most impacted by the Atlantic salmon farms in Norway. A recent study showed that escapes have affected 340 wild salmon populations. As Norway has a native wild Atlantic salmon population that is genetically distinct from farmed salmon, hybridization from escapes has important consequences on the possible decreased fitness of native populations. A 2010 study found that sea lice from Norwegian salmon farms have a significant impact on wild salmon, char, and especially wild sea trout. Global salmon aquaculture production in 2013 exceeded 2 million tonnes. About 2.1% of this was produced in Atlantic US and Canada in 2013. All Atlantic salmon aquaculture in Atlantic US occurs in Maine. The majority of the farm sites in Atlantic North America are owned and operated by Cooke Aquaculture Inc. as well as their subsidiary Kelly Cove Salmon Ltd. Brand names include True North Salmon, Heritage Salmon, and Jail Island Salmon. As of 2011, 60% of the Atlantic salmon produced in Atlantic Canada was exported to the US. About 7% stayed in Atlantic Canada, and the rest was distributed throughout the rest of eastern Canada. Individual sites do not cause significant localized impacts as a result of effluent although there are potential cumulative effects of multiple farms. Farm sites can cause severe habitat impacts although the majority have low environmental effects. Of serious concern is chemical usage. The quantity of antibiotics used is higher than other countries farming salmon– 23,000kg in a single year. The type of antibiotics is also of concern – some are classified as highly and critically important to human health by the World Health Organization (WHO). Resistance to pesticides has developed on at least two occasions, and the illegal pesticide cypermethrin was applied multiple times despite government monitoring and the knowledge of lobster mortalities that would occur as a result of its use. Approximately 1.75lbs of wild fish product are required to produce 1lb of farmed salmon which is a relatively low amount, especially compared to historic values. Sources of the marine ingredients are herring, menhaden and anchovy from Atlantic Canada, Atlantic US, Gulf of Mexico and Peru. These fisheries are not currently a conservation concern. Construction of open net pens has improved over time, and the risk of escapes has decreased, but cannot be said to have been eliminated. In Canada, escapes still occur and farmed fish have been found to represent 70.3% of the population in Magaguadavic River. Wild Atlantic salmon have drastically declined from their original population numbers and are considered endangered. Thus negative impacts of escapes on the wild population as well as the habitat are a serious concern. The potential for transfer of disease and/or parasites to wild fish is high. Diseases and parasites of concern include bacterial kidney disease (BKD), infectious salmon anemia (ISA), and sea lice. There are no regulatory thresholds for sea lice loads in Atlantic North America. Although there is little evidence to show high rates of transmission to wild salmon, there is a high risk of potential negative impacts to the endangered wild salmon stocks. As the majority of the salmon farms in Atlantic North America are operated by Cooke Aquaculture Inc., the company is a major source of data. Much information is available on the industry via peer-reviewed scientific papers. Farmed Atlantic salmon are sourced from domestic stock, thereby putting no pressure on wild Atlantic salmon stocks. Scotland produced approximately 171,722 mt of farmed Atlantic salmon in 2015. Production is expected to increase to 210,000mt by 2020. Almost all product (98.7%) comes from six companies operating 87 freshwater sites and 254 active sea sites. The US imports the majority of the salmon farmed in Scotland. The effects of the salmon farms on the pelagic environment are not significant beyond the farms’ allowable zone of effect (AZE). Effects on the benthic habitat below the farms can be detrimental, but decrease rapidly away from the pens, and are also reversible. Additionally, Scotland accounts for cumulative impacts by limiting the production of each farm based on the estimated environmental sensitivity and carrying capacity of each area. Antibiotic use in Scotland has decreased to very low quantities due to biosecurity regulations and vaccines, and only one antibiotic that is highly important to human health is used. Of concern is the drastic increase in the use of pesticides to control sea lice. This has caused loss of effectiveness, as well as pesticide resistance. Cumulative impacts of pesticide use by multiple farms are not considered. About 1.25lbs of wild fish product are required to produce 1lb of farmed salmon which is a low amount. This is partly due to the increased use of non-edible land-animal byproduct and plant products. Large-scale escapes have occurred in Scottish salmon farms, leading to tens of thousands of farmed salmon escaping with insignificant recaptures. This is of high concern due to the presence of wild Atlantic salmon in Scotland. Research has shown that a quarter of salmon are hybrids of wild and farmed salmon. Hybridization has important consequences on the possible decreased fitness of native populations. Disease and parasite outbreaks have declined on fish farms, although still occur. It is unclear whether the fish farms transmit diseases such as the newly identified piscine reovirus (PRV) and parasites to wild fish. While sea lice levels are regulated on the fish farms during wild salmon migration, they are not controlled during the rest of the year, allowing for the possible infection of sea trout. Since salmon farms are located on migratory routes of wild salmon, potential risks for the farms to act as sources, or to exacerbate the impacts of diseases and parasites on wild fish cannot be ruled out. Licenses regulate predator control of grey and harbour seals, and these mortalities do not significantly impact their populations. Nova Austral operates in the southernmost region of Magallenes and Chilean Antarctica, producing Atlantic salmon in open net pens. In 2016, 24,671 mt of salmon were harvested, 30% of which was exported to the Unties States. Nova Austral uses antibiotics infrequently mainly due to the absence of Salmon Rickettsial Syndrome in the region. There is also currently no sea lice present in any sites. However, chemical use due a disease outbreak could increase at any time. Fish oil from 1.95 t of wild fish is used to produce 1 t of farmed salmon. There is a 31.6% net loss of edible protein. In 2016 8,301 salmon escaped from a production facility. Although it is unlikely that the species will establish a population and compete with native species. Due to the logistical challenges of operating in a remote area, Nova Austral currently ships all smolts a considerable distance by well-boat from hatcheries in northern Chile. There are concerns in regards to the potential introduction of pathogens and other organisms into the region, however there are currently plans in place to build a hatch nearby. Atlantic salmon from open net pens in the Faroe islands totalled 70,000 mt in 2017, with around 13,500 mt imported into the US. Two thirds of sites have minimal effluent, with the others considered polluted; however, research indicates that the pollution can be reversed in a year. Disease is low and no antibiotics have been used for over ten years, although pesticide use for sea lice is variable and can be substantial and impacts on sea trout are not monitored. Moderate concerns over feed exist as two metric tons of fish are used to produce one metric ton of salmon. There are no concerns over genetic impacts from escapes as no wild populations exist. Culling of hundreds of grey seals is practiced by the industry and the impacts not fully understood. 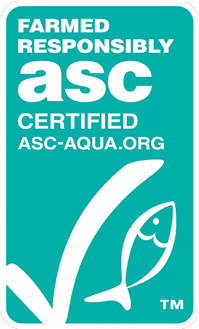 Ocean Wise recommends some Aquaculture Stewardship Council (ASC) certified fisheries, but not all. Learn more about which ASC fisheries we recommend.